Beddgelert stands at the junction of three vales, near the confluence of the Rivers Glaslyn and the Colwyn, surrounded by a beautiful landscape of mountains, woods and streams. 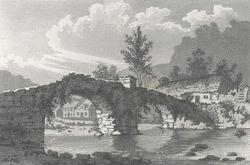 In the 18th century the village started to grow, largely as a result of the development of the surrounding road network and the resulting new passage to Caernarfon. The bridge was built by 1796 and the beautiful village started to attract tourists.